In Mediterranean cooking, slow cooked salads like this recipe for Sephardic Eggplant Salad are appetizer staples. 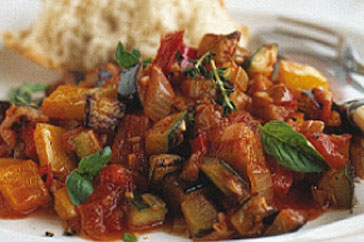 Long simmering allows the vegetables' natural flavors and a rich, smooth texture to develop. Usually, this type of dish is cooked in a fair amount of olive oil. In this version, I reduce the oil considerably. Adding water from time to time keeps the food from sticking to the bottom of the pan. The water also deglazes the pan for a rich, memorable sauce. 1. Pour oil into a large skillet over medium high heat. Add onion and cook, stirring until softened, about 5 minutes. Add eggplant, garlic, bell pepper, tomatoes with liquid, sugar, salt, turmeric and 1/4 cup water. 2. Bring mixture to a boil. Reduce heat to low, cover and slowly simmer for 1 hour. Check occasionally. If mixture sticks to the bottom of the pan, quickly add 2 more tablespoons of water to loosen the browned bits and stir to incorporate them into the sauce. After an hour, remove cover and cook until thickened. 3. Cool to room temperature. Add olives and harissa to taste. Serve at room temperature. For more sephardic recipes like Sephardic Eggplant Salad, try my Rosca recipe and Bamia, a delicious way to make okra recipe.